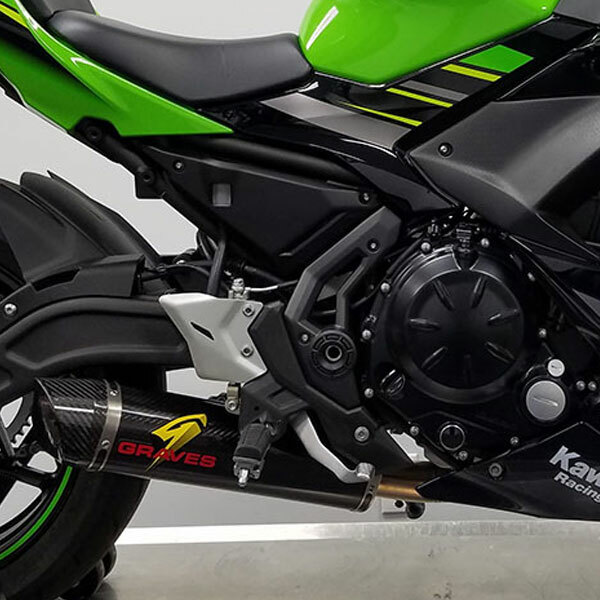 Graves Motorsports Full Stainless Steel Exhaust System for the 2017-2019 Kawasaki Ninja 650 / Z650 with carbon fiber silencer. GMS Exhaust systems are designed for the elite rider seeking top of the line performance, fit, finish and value. This exhaust system was developed using the same technology that has powered the Graves' supported race teams to 8 AMA / MotoAmerica Superbike championships and numerous 600 championships. Stock Full System Weight = 17.6 lbs. GMS Full System Weight = 6.6 lbs => 11 lb weight savings!